Educating the keepers of tomorrow is a priority for the future of the hobby and key to this is the provision of quality learning environments. Coast to Coast Exotics enjoyed playing an active part in this when it was asked to fit a full animal care unit in 2016 at East Durham and Peterlee College. This was then followed by completing two reptile rooms, an aquatic room and a reception display at a college in Croxteth, Liverpool in 2018. 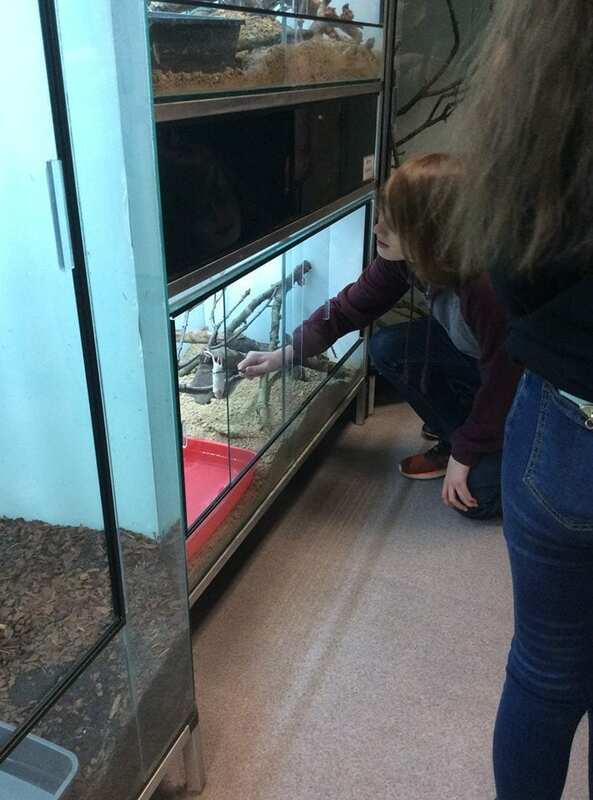 Myerscough Croxteth College contacted Kevin in February 2017, with a view to installing new vivaria, aquaria and associated equipment into their new animal care unit at the Croxteth campus. This followed Coast to Coast Exotics previouse involvement in the fitting of equipment at their Preston campus, several years ago, and after several meetings and a site visit at Preston campus to ascertain their requirements, the contract was agreed and signed in September 2017. The start of the fitment, the blank canvas! In order to respond to the breadth and level of student needs, their reptile and amphibian requirements were varied, requiring several aluminium racks with custom glass terraria, two open topped tortoise pens, two 3.5m long vivaria (stacked on top of each other and made entirely of aluminium and acrylic), one all glass display vivarium in the reception area, two aluminium racks for Exo Terra Glass Terraria, two large tall corner vivaria and one large multi-aspect central tall vivarium. 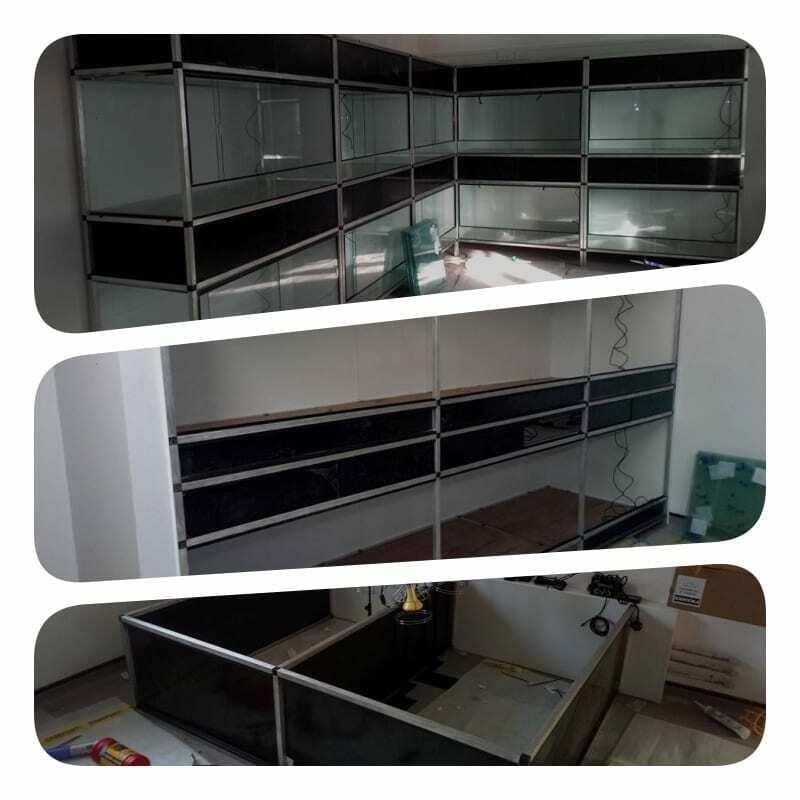 From an aquatics perspective, several aluminium racks were provided, holding two coldwater aquaria, several tropical aquaria and two marine aquaria – to include a sump system and a cupboard to house the RO system and other associated equipment. In addition to this, we also secured the supply of the housing for several of the rodent and small mammal rooms, on a supply only basis, with no racks, installation nor associated equipment. In terms of equipment to be used for heating and lighting, the specification stipulated that they needed to be ‘as state of the art as possible, and on this basis a full range of top flight thermostats and spray systems to T5 lighting and ceramic heaters were installed in the reptiles through to the latest lighting, filtration and marine systems in the aquatics room. 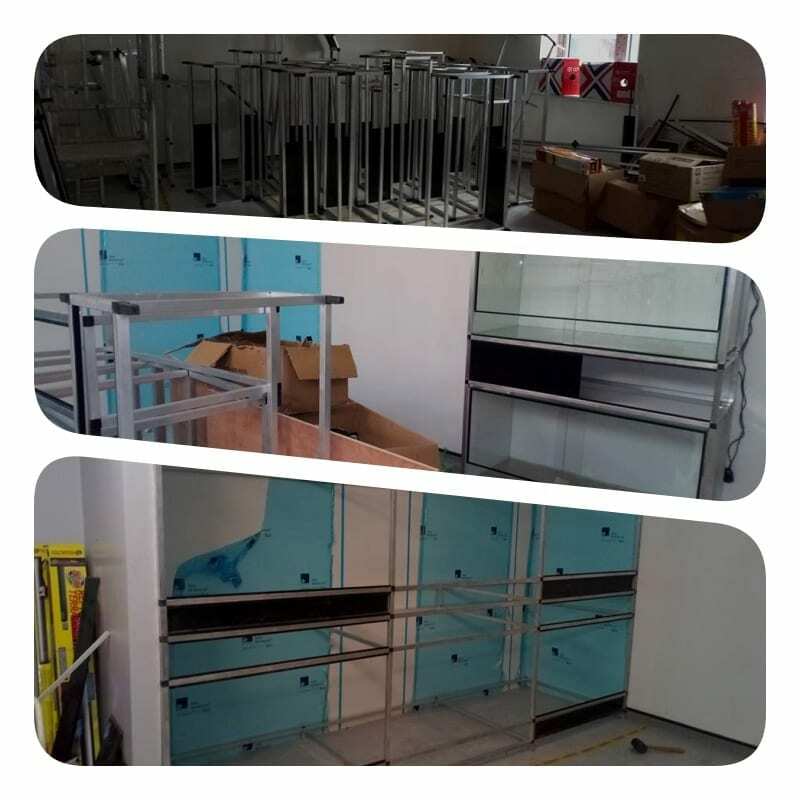 Work started, building the custom glass terraria and aquaria and aluminium racks in early December 2017 – we had a slot to install at the college, over a two week period, at the end of January 2018. We spoke to suppliers, to ensure stocks were made available to us, as we would need a lot of everything. 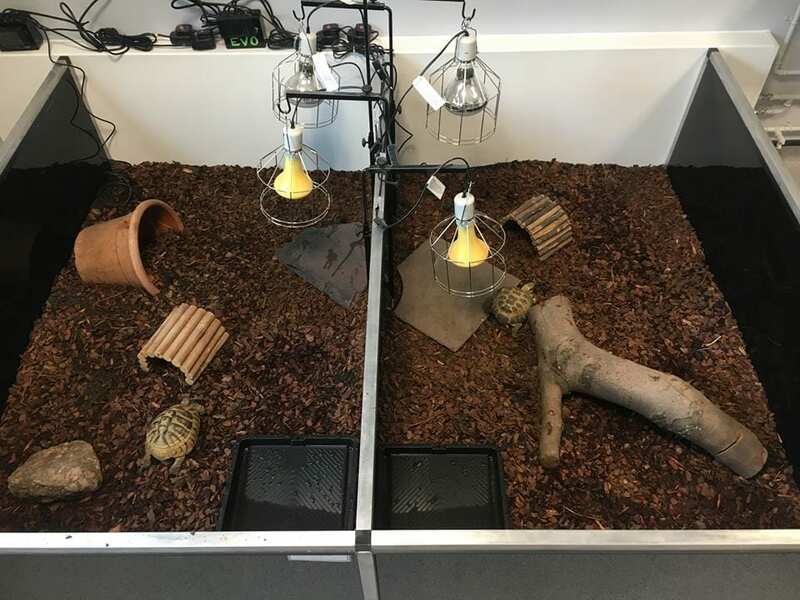 Reptile product wise, the choice was obvious, with the use of Microclimate thermostats, Zoo Med T5 and LED lighting, ProRep Ceramic heaters and fittings, Lucky Reptile Heater reflectors and MistKing systems. There were small amounts of various other fittings, heaters etc from Zoo Med, ProRep and Exo Terra. Most of the hardware arrived with us, so we could prepare it all during December – including the custom thermostats we requested from Microclimate. By mid January we were more or less fully ready for our slot at the college! A week into the fit and all is going well! Another week to go! We have done several college fits over the years, and generally we worked directly for the college and gain access once the construction company has handed the building over. On this job, we were contracted to the construction company, and when we arrived to begin the install we faced the additional challenge of the site being far from finished – around six weeks behind schedule. The building was secure but had no electric, no water, no finished surfaces (including floors) – it was a typical building site with dozens of trade people to work around and the mess they make. It was far from ideal, but we were contracted to complete in our allocated slot, so we began work. By the end of week one we had more or less installed reptile room two, with several racks of terraria and two open topped tortoise pens. Reptile room one had all of the vivaria racks, tall corner vivaria and the central multi-aspect vivarium installed. The two large 3.5m vivaria had not been started – the joiners had not fitted the stud wall at the correct measurements. The display vivarium in the foyer was more or less installed. 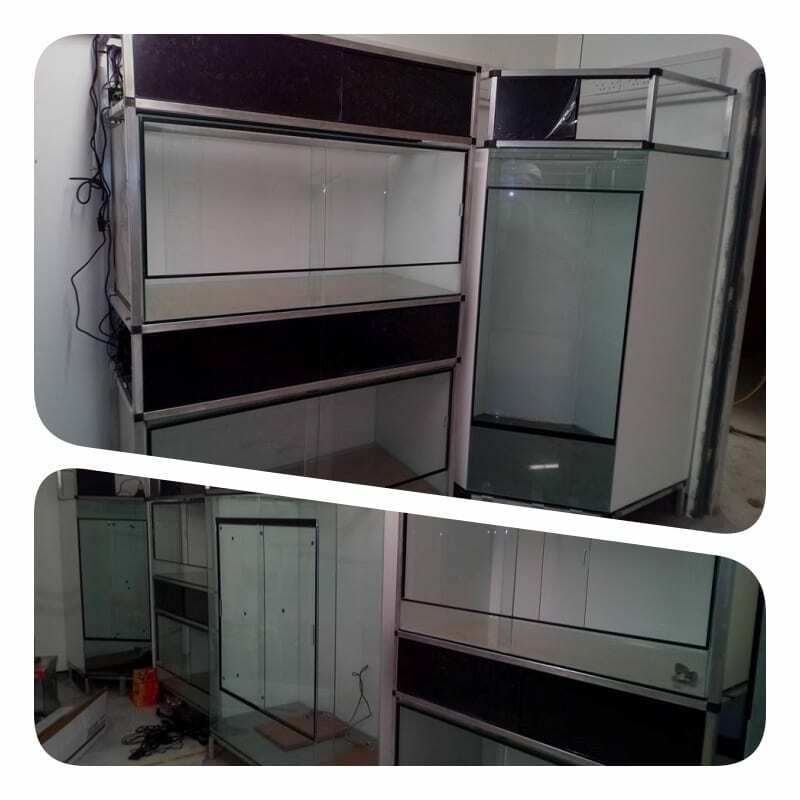 The aquatic room had all the aquaria in place, all that was left to do was the RO / Equipment cupboard. As we left, on the Friday afternoon for our weekend off, we were pleased with how the first week had gone. 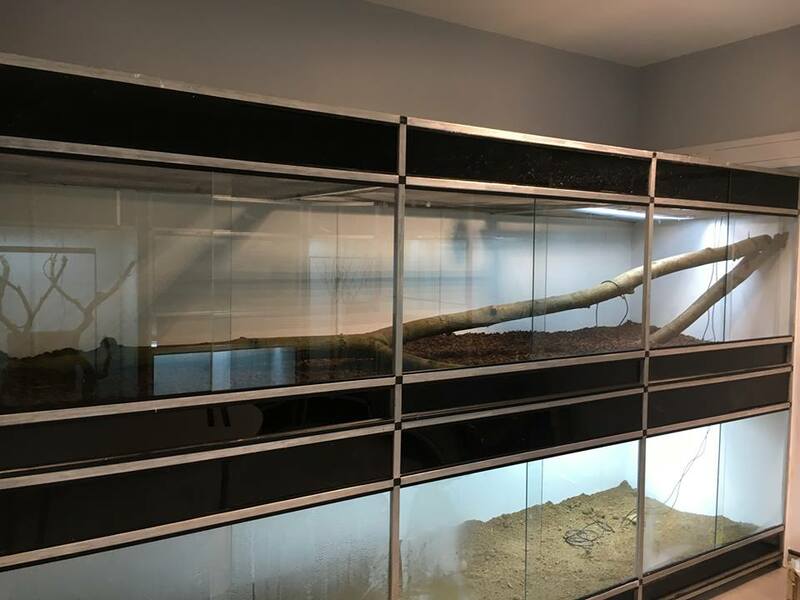 The following week we had to wait until the necessary work had been done by the joiners for the two large 3.5m long vivaria – but we had work to do as an alteration to the rack housing the Exo Terra Glass Terraria was required as, again, somebody somewhere had messed up measurements. Our measurements were double checked, and correct, the construction company was at fault. As a gesture, and as we were waiting to get to the 3.5m long vivaria, held up by the joiners, we altered the rack to fit. We hoped by then the incorrect stud wall would have been altered – by mid-week it hadn’t, and to make matters worse we had also realised the electricians had installed the overhead sockets too low. We made a decision to alter the double tier 3.5m long vivaria to fit what we had, as time was getting tight. This was quite a task, and took a lot of time, but eventually it was done by Thursday knocking off time. This left Friday to finish the install of the RO / Equipment cupboard in the aquatic room – as we left we were thanked by the site management for our professionalism and enthusiasm for working around problems – it appeared this kind of flexibility and ‘can do’ attitude was quite rare within the construction industry! Within seven days we had been paid by the construction company, I had ensured a clause was in the contract to oblige them to this as cash flow to a small business is critical. We revisited once the building had been handed over to the college to do a full induction and training day, the college staff, from the top to the bottom we ecstatic about our work – it was a nice way to end the job and give us all a huge sense of satisfaction. We’ve fitted several colleges over the years, two in the last two years. Not only does the money come in extremely useful, we get a buzz from the fact knowing that countless students will have access to quality equipment to learn about, and to look after exotic animals – from future veterinary to the pet shop owners of tomorrow. Contact Kevin Stevens for more details on our college and shop fitting services.